We want you to share your book cover with us. An attractive cover is a big element in the appeal of your book.We want the details about yours. 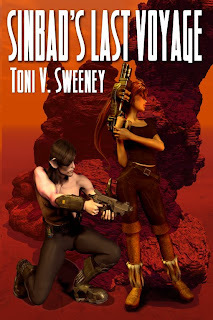 I was asked to provide a scene I thought would be appropriate for the cover of Sinbad's Last Voyage. I decided on a scene near the end of the book where Sinbad and Andrea are on the edge of a cliff, surrounded by Albegensi warriors who are firing at them with lasers. The publisher designed the cover. I believe he does most of the covers himself. I had to give him a physical description of the scene, and the two characters--how the cliff-edge was covered with boulders, what Andi and Sin looked like, their clothing, weapons, etc. The main problem we had was with Sinbad's ears. Being part-feline, he has pointed ears like a lynx's. I kept getting this e-mail asking, "What does a lynx look like?" so I did my own sketch of Sinbad and sent it to him. We decided to leave off the moustache because later, he shaves it off. Deron Douglas, publisher and editor of Double Dragon Publications. Other examples of his work can be seen at www.derondouglas.com. I think it shows exactly what I wanted. The ears--a little more pointy on the tip. Sinbad, naturally. He's portrayed physically as I described him in the book. www.lulu.com (for paperbacks); www.doubledragonbooks.com (for e-books). This cover is appealing. I haven't read the book but it has moved to the head of my reading list. This author is one of my favorites.